This is the hottest place in Britain. Not this week, but ten years ago. The summer of 2003 was particularly hot, with a prolonged spell of thirty-plus temperatures in early August. Data received on 10th August 2003 showed that the temperature in Gravesend and at Kew Gardens had reached 38.1°C, a degree higher than the UK's previous record. And then a few weeks later new figures arrived from an amateur weather station in North Kent who only sent their readings in monthly. The Met Office checked the numbers, and checked the thermometer, and confirmed a new highest ever UK temperature of 38.5°C. At Brogdale, near the M2, on the slopes above Faversham. There were mutterings amongst meteorological folk. How could an amateur be trusted to read a thermometer? Why didn't they phone in their amazing reading earlier? How come none of the surrounding stations recorded a similar anomaly? And what about that big Leylandii hedge alongside the Stevenson screen, didn't that invalidate the record? The Met Office investigated, and said no it's fine, and Brogdale held the UK temperature record. Still does. Brogdale is a really interesting site. It's the home of the National Fruit Collection, which is a Government sponsored project to aid experimentation and preserve diversity. Its acres are home to 3500 named varieties of fruit, most of them apples, but also pears, plums, cherries, quinces, grapes and other berries. There are two of every tree and bush, for ecological safety reasons, all laid out in neat rows (as an aerial shot will show). Scientists wander amongst the plants counting aphids, or whatever they do, and the whole thing is run as a very special farm. Best of all, you can come and have a look round for yourself. I went at the weekend. Three guided tours are run daily between Easter and the end of October, with experts wandering the fields according to what's in season. That's not so good at the moment, because 2013's late spring has put everything behind, so ripening is occurring about three weeks later than usual. Normally in July there'd be fruit to pick and taste, and in a few weeks there will be, but it's still a bit early yet. 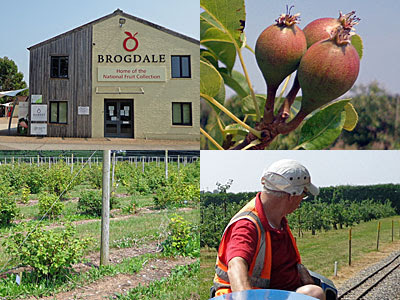 If you're planning ahead to time your visit to Brogdale optimally, spring is best for blossom and autumn is best for fruit. I thought I was going to get a £7.50 tour to myself, but then the tourist group from hell turned up and decided to tag along. Bloody Londoners. They took forever to buy their tickets, then asked for a delay while their little girl visited the toilet. Their friends who didn't want to go on the tour asked all sorts of delaying questions, then got told off for wandering into an orchard unsupervised. Eventually we started up the hill, held back by a bloke younger than me walking with a crutch. In the shade of a tall hedge we stopped for our guide to explain a bit about the farm, at which point one of the wives announced she was pregnant and a long walk in the midday sun was beyond her. She walked back to the start, taking the other wife and small child with her, then rang up the husband (who'd stayed) on his mobile for a five minute chat. The tour got better after that. We walked through the apple field, which contains 2300 separate varieties. The trees are laid out in order, from the earliest to ripen to the latest, and pruned quite low allowing experimentation at eye level. Each is labelled, which is useful if you can't tell your Laxton's Fortune from your Duchess of Oldenburg. And every tree is doomed. This field has been the National Apple Collection since 1977, which is getting on a bit in apple years, so the field nextdoor is being lined up as a replacement. Its saplings will be ready by 2017 or so, at which point the current field will be ploughed up and left fallow. Not all the existing varieties have earned a place in the new field - that's been a matter of negotiation between the gardeners, the scientists and the government. DEFRA usually wins. 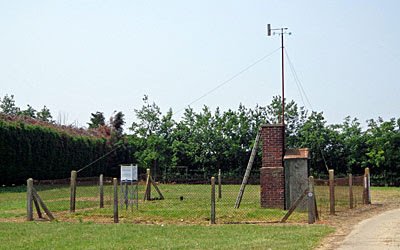 We passed the weather station at the top of the apple field, currently registering merely twenty-something, then wandered over to see the bush fruits. These were some of the only fruit to be sort-of ripe on the entire site, and even then only just. "Here, try this, it was the Queen Mother's favourite," said our guide. Those who know me well will be amused to hear that I sampled a gooseberry, a Golden Drop, and didn't spit it out in disgust. There wasn't time to reach the cherries, nor the plums, nor the apricots, but we did get to enter the National Pear Collection. 2013 is this incarnation's last summer - a replacement field at the far end of the site is almost ready. To explore the rest of Brogdale I took the train. The Faversham Miniature Railway is based here, with a 9 inch gauge diesel engine pulling teensy carriages through the trees. I got to see the plums as we rode by, and also one of the cherry orchards where some of the fruit was actually the proper red colour. That bodes well for the Brogdale Cherry Festival, which takes place in a couple of weekends' time, or there's Plum Day and the Cider festival in August, or the Apple Festival in October. Potential visitors might also enjoy the Fruit Shop (which sells Brogdale-grown produce), the Garden Centre (which sells Brogdale-grafted trees), a micro-brewery, a cafe and a cluster of farm shops (all accessible free of charge). If you're a proper gardener, a botanist, or just someone who likes fruit-based alcohol, consider a visit. Just hope it's not 38 degrees the day you come. Faversham: A proper medieval town at the end of the High Speed line from London. I'd never really considered coming here before, but Faversham is a rather lovely place, helped because (unusually for Kent) the Luftwaffe generally gave it a miss. The creek runs out into the channel round the back of the Isle of Sheppey, so it's not really seaside, but the seagulls squawk a lot. The centre of town is picturesque and independent, but not really somewhere on the tourist trail. A sidelined secret. Fleur De Lis Heritage Centre: Another of England's unsung town museums, this one threads through a 15th century pub and adjacent buildings. The interior is helped immensely by Faversham having a chequered history, from royalty to gunpowder, plus all the usual local ephemera. Not an overly busy museum, though, and the lovely fussing ladies on the front desks outnumbered me five to one. Shepherd Neame Brewery: If you think about it, you'd expect Britain's oldest brewer to be located in the hop fields of Kent. 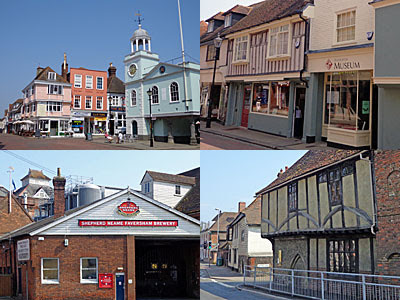 Tours should be booked in advance, but there is a Shepherd Neame shop in Court Street, or of course you could pop into almost any pub in the town for a very-local pint. Chart Mills: It's not easy to find (in the middle of a housing estate, just round the back of the Shrine of St Jude), and it's not often open, but this gunpowder-mixing watermill is the oldest of its kind in the world, and the volunteers would love to see you. Maison Dieu: What's now the A2 just to the south of the town used to be part of the main pilgrimage route from London to Canterbury. That made the small village of Ospringe (great name) unduly important as a stopover point, and the equivalent of a medieval service station opened up. Most of that's long gone, alas, but English Heritage will happily welcome you to the half-timbered survivor at the top of Water Lane for a two quid poke-around. Faversham: No, really, it's worth considering as a convenient and unspoilt day out.